Click here to save up to 50% on UTG Scopes! UTG scopes are the scopes to have when it comes to acquiring maximum reliability and accuracy in every hunting and tactical scenario. Sure, one could argue that the same thing could be said of all other scope makes, from those who use animal motifs as model names for their riflescopes to a certain topnotch camera manufacturing company that has put their knowledge of lenses and scopes to good use in the riflescope industry. However, UTG is able to rise above the heap and become part of the cream of the crop with its bedrock precepts behind every scope they make. They have high standards and quality control take care of every scope’s uncompromising performance, rugged reliability, and optical precision. That’s what makes it able to compete with famous scopes in the industry. It has the standards and knowhow to match those other scopes, plus UTG itself is quite the innovator. It’s able to push its scopes from the AR platform to many other gun types, from pistols and handguns to shotguns and rifles. They strive to find better ways to do things, which serve as their hallmark of excellence. It’s this commitment and sense of duty that arguably has put UTG scopes on the map. These are all the same attributes that their primary consumers, American men and women, uphold. Freedom, unity, and the American way of life have everything to do with gun ownership and the right to protect oneself. Besides which, each and every one of these products were developed shoulder-to-shoulder with competitive shooting communities, law enforcement, and the military. Here are the product specs and benefits of the most popular UTG scope models. Click the image for UTG Bug Buster prices and reviews! UTG 3-9×32 CQB Bug Buster: For only $89.00, you can get your own UTG 3-9x32AO Compact CQB Bug Buster (UPC 4712274528321) by buying it off of Amazon. The main claim to fame of this variant of the UTG line is its multiple features that can put even a smartphone or a Swiss Army knife to shame. It has ¼ MOA (Minute of Angle, which means you’ll get per 100 yards ¼ of click value), a Mil-Dot reticle that’s red or green illuminated, parallax adjustment for three yards to infinity, and a 14 feet field of view at 100 yards. Its 32 millimeter objective lens that’s adjustable has 3x to 9x magnification as well. This black beauty of a riflescope requires a CR1620 lithium battery to work. Click the image for UTG 3-9×40 AO prices and reviews! 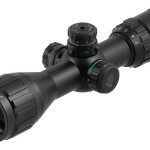 UTG 3-9×40 AO Mil-Dot Rifle Scope: As for the UTG Rifle Scope RGB Mid-dot Scope Sight, its main claim to fame that separates it from its Leapers UTG Bug Buster Rifle sibling is that a 11.5 feet to 34.5 feet field of view at a 100 yards, emerald-coated lenses for best clarity and maximum light transmission, pica tinny or weaver rings, flip-open lens caps for superior lens protection, and the Mil-Dot Range Estimating Reticle with Premium-Grade Zero Locking and Resetting capabilities that ensure optimal aiming and shooting performance. Like the CQB Bug Buster Rifle Scope, it has per click windage or elevation adjustment, Red plus Green plus Blue Riflescope sight, and ¼ MOA that offers ¼ of click value per 100 yards. Click the image for UTG 30mm Swat prices and reviews! UTG Compact 3-12×44 Swat AO Mil-Dot Rifle Scope: The New UTG Compact 3-12×44 Swat AO comes at a $124.95, which makes it more expensive than the Rifle Scope RGB Mil-Dot Zero Locking Scope Sight or the Leapers UTG 3-9×32 CQB Bug Buster Rifle Scope. The leap in expensiveness might be because the New UTG Compact comes complete with some of the most powerful sighting options, features, and specs you’d ever see in a UTG scope, such as the fact that this 44-millimeter scope has special circuit housing design that gives uninterrupted illumination even when you’re dealing with a heaver recoil rifle, which the scope is perfect for. Aside from enhanced illumination technology, the scope comes with parallax adjustment for 10 yards and up plus it’s also shockproof, fogproof, and rainproof. UTG 3-12×44 30mm SWAT Compact IE Scope AO Mil-Dot 36 Colors Illuminated Sights: This scope is a real bargain, especially once you see its specs. Not only does it uphold high UTG scope standards of being rainproof, shockproof, and fogproof thanks to its completely sealed 30 millimeter tube construction filled with nitrogen that ensures no moisture could damage it from the inside. It also comes complete with ¼ MOA per click windage or elevation adjustment, side wheel adjustable turret for your parallax-adjusting needs, and seven brightness settings that enhance its reticle visibility and target acquisition no matter how extreme the condition it’s facing. Furthermore, it enjoys an original RGB Mode of Red or Green Illumination that comes with those brightness and illumination options. 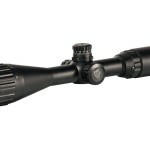 Leapers UTG 4X32 Varmint Hunter Scope Adjustable Obj. 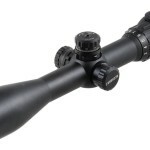 Scope SCP-U432AOD: The $28 Leapers UTG 4X32 Varmint Hunter Scope is UTG’s answer to the varmint hunting line of scopes of its competitors, particularly a certain camera manufacturer with a decent riflescope line. The one found in eBay at the time of this writing is a used one, which explains the price. It usually costs a good $54 to $55 in other stores. At any rate, whether brand new or secondhand, the SCP-U432AOD is one tough customer built on the True Strength Platform. It has the UTG requisites of being sealed with nitrogen inside and being rainproof, fogproof, and shockproof. Many gunmen and airgun enthusiasts love its finger-adjustable target turrets with a consistent ¼ MOA that makes all the difference in consistent accuracy. Compact Rifle Scope with Laser Combo + QD Laser mount UTG 3-9X32 Bug Buster: The Compact Rifle Scope with Laser Combo is a $144.95 value mostly because of the additions of a QD laser mount and laser combo features. It’s essentially the Leapers UTG 3-9×32 CQB Bug Buster Rifle Scope, but instead of rings and sunshade, you get a laser-sight scope that increases your accuracy by leaps and bounds. 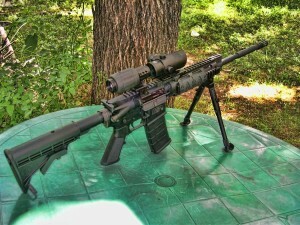 You’ll feel like you’re in the SWAT with this scope added to your rifle. It has decent specs that are to be expected of the Bug Buster line, such as 37.8 feet of maximum field of view at 100 yards and 13.6 feet minimum field of view at 100 yards. 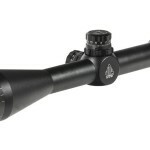 It can also go from 3x up to 9x magnification, which entails quality parallax adjustment. Click the image for UTG 4-16×40 AO prices and reviews! 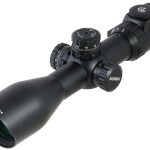 UTG 4-16X40 AO Rifle Scope: At $75.99, the LEAPERS UTG 4-16X40 Full Size AO with 4x to 16x magnification is certainly a bargain, especially with its extra magnification for truly long-range shots that you won’t be able to do with the 3x to 9x Leaper models. The scope comes complete with tube construction that’s an inch in diameter, an objective lens diameter of 40 millimeters, and a field of view at 100 yards that ranges from 5.8 to 23 feet (with parallax adjustment). If you’re worried about recoil from your heavy rifle giving you a black eye, you’ll be offered plenty of eye relief at 3 to 3.2 inches (that is, you can see the target clearly with your eyes three inches away from the lens). UTG 30mm Swat 3-12X44: This beauty doesn’t betray the Leapers brand and UTG riflescope mission-vision of scope excellence with its specs that includes a 30-millimeter tub construction and best-in-class multi-emerald-coated lenses capable of achieving maximum light transmission even in low-light conditions. What’s more, the UTG Leapers 30mm Swat 3-12X44 of the Accupoint also comes complete with 3x to 12x magnification, an AO Mil-Dot reticle, 36 colors EZ-TAP with MS Rings, and so forth. Naturally, it’s also rainproof, fogproof, and shockproof because it’s sealed tight and filled with nitrogen inside. Finally, it’s parallax adjustable and a super-accurate standard-issue ¼ MOA. You won’t have to deal with wounded game because of many near misses from getting the wrong scope for your guns as long as you go the UTG route of scope hunting. The UTG line of riflescopes, unlike certain other brands, is quite dependable when it comes to variation. Instead of offering more of the same scope in every new model except the slightest adjustment in specs, there’s real variation from every make and model of scopes out there, thus you’re really getting more value for your investment as you do your research from one scope to another. With a UTG scope, it’s not necessarily a situation where you’ve seen one scope you’ve seen them all with little differences in specs here and there. The leading and most-well-known brands in the riflescope industry also follow this philosophy in scope manufacturing. What’s more, the other great thing about the Leapers line of UTG is their consistency when it comes to pricing. As you’ll notice in this review, every scope comes with a consistent price of around $70-$120 barring outliers like used models that were cheap from the get go or models with additional accessories added to them. Even though there are other, more popular scopes out there, UTG still manages to stay in business because it’s the cost-effective choice that delivers consistency and variance per model, per brand, and per product.